How do we cultivate patience? That’s the prevailing theme for the week. It’s shown up in almost every session with clients. And we all seem to agree: it’s HARD to do patience. So yes, I’ve been known to ask clients how they cultivate their patience. But I’ve learned it’s not a very effective question. And now I’m considering that maybe it’s more about why we find patience so difficult to corral these days. Of course, the patience problem nips at my heels too, as I struggle to contain the part of me that wants to run headlong toward too many things. Even though I’m intimately familiar with this impatient inner kid who seeks distractions so she won’t have to settle down to what’s right in front of her, it doesn’t make it any easier. In fact, I’d venture to say it’s gotten harder in the past ten years. So today I’m thinking that it’s actually the buildup of distractions in our world that’s made my patience muscles go all weak and puny. In other words, more distractions over time = less patience skills. Yeah. But how do we cultivate patience?! Okay. You probably noticed I haven’t answered the question that I opened with. So I took up my art journal, hoping an image would appear. It did. Patience, apparently, has blue eyes and blue hair. Beyond that, she’s deeply rooted, emerging from a sturdy tree trunk. Both young and old. She has lines and crow’s feet, but there’s a luminosity that shines through. Mossy bits cling to her, while tiny buds vine their way up, patiently waiting for the day they’ll bloom. And Patience is many-ringed. If you were to cut her down (but who would want to?) you could trace her years like you can on a visit to the trees in Muir Woods. I think Patience is telling us that she’s deep within. Never lost. Just maybe needing some love and attention. And in the act of drawing her out, I feel infinitely more patient. How do you cultivate your patience? I used to think that patience was easy – just something that happened. I am beginning to think that patience requires more effort. It is the absence of anxiety; the appreciation of space and stillness of a sort (mental). It is the recognition that Rome wasn’t built in a day and the patience required to persist in the effort or the building or the creation. I am… get this… cultivating patience by stopping, listening, “not reacting”… by allowing myself to fully breathe in the moment and settle… even attempting to find humor in this or that… but mostly, for me, finding patience and cultivating it is about learning to stand and be still. I felt so at home reading this post about the struggle with cultivating patience and the mention of Muir Woods and Vertigo, a film that includes one of my favorite spots in the City, Fort Point. As for cultivating patience, it’s a daily struggle for me. Some days I’m completely satisfied catching up with facebook friends while standing in line at the grocery store. Other days, I’m arguing with husband over something that is mostly a difference in female/male approach to things. Maybe I should look at the bright side of impatience; that it’s a sign of being driven, passionate and alive. Maybe, I’m drowning in my own rationalizing that I can’t tell what’s good and what’s bad. Or maybe, I’m really patient enough about many things that I don’t notice or give myself credit for and there are some sticking points that may or may not need work. Or maybe I’m growing more and more patient now that I’ve said maybe five times (you are one patient lady for reading this!). Anyway, love the drawing. She’s pure rock n’ roll and quite possibly someone who would breeze through long lines instead of having to cultivate patience. Patience is like stale bread and no milk and eggs to make yummy French toast! It is hard to chew and rather bland. Until we understands that it’s keeping us from starving. It’s got nourishment even if it’s not our first choice. And when we get to that place of acceptance for the meal in front of us, the seeds outside start sprouting and with them, the promise of a luscious meal. The first step towards patience for me is ACCEPTANCE of life as it is. Not with a deep sigh but with gratitude. How does one cultivate the ability to accept and wait? I do it by never losing track of what I truly want and keeping the faith that it is coming my way on its own perfect timetable. Patience and hope go hand in hand for me. This is one way that really helps me reconnect with patience: EFT. Hi Patty! Well how timely! Just had a “talk” with myself about that in my early a.m. journaling as a matter of fact. And oh the comments are lush and rich here! SO glad I came by! I’ve been “accused” of being THE most patient person on the planet and yet inside I don’t feel this way at all, at least not always. I agree with the comments about “finding it” in the stillness – that stillness is something we have to incorporate into every single day. It’s a fleeting little thing, that feeling of patience! I find that being greatful and accepting of every moment and what it brings can be harder to do than say, but that is the ticket. I often find when I am really feeling impatient with something, or someone, it’s just that control/ego thing rattling its way into my thoughts. The Beatles had it right “Whisper words of wisdom, let it be, let it be”! Hi M, Belinda, Maryse, and SuZen – I wish I had the patience to answer each of your comments individually. (Just kidding – but you knew that right?) Actually, I wish I had the time. But since I don’t, I just want to say that I am loving all these different takes on patience and how we get more of it. I am sinking into them, and yes, Maryse, chewing on some of that stale bread. Big hugs and thanks to all of you. I love what came out of your journal. You’ll be happy to know I bought all of my art supplies and now am the proud owner of my own art journal. Your post and photo a while back gave me the final push. Patience. I’ve come along way, baby. I think slowing down brought me patience. It came walking right in my life one day when I wasn’t looking. Because I slowed my life down! Thanks for the inspiration and I love Muir woods. I agree that it’s cultural. If you go to other countries, they spend a lot of time lounging around, whereas we’re always scuttling from one place to another, much of it not all that important if you think about it. The they’s have us hopping all over the place, rushing here and there. I swear it’s to keep us so “busy” we won’t notice what the they’s are doing. I’m more contented than at any other point in my life and relate to the middle of young and old place. It’s a good place to be. If I find myself getting impatient, I’m almost always aware of it and try to remember that this other person I’m getting impatient with is just as important as I am. Somehow it feels related to listening, a skill few Americans seem to possess. When I actively listen, I seem to be less impatient if that makes sense. I also like your drawing. 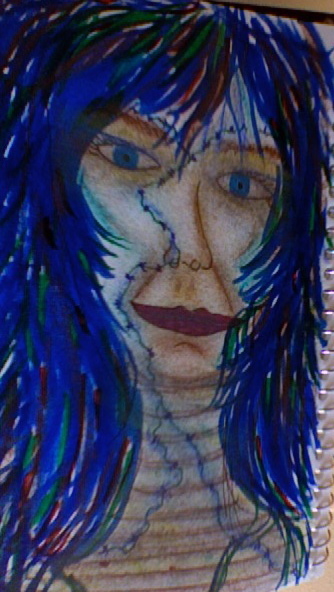 The woman – Patience – looks like she’s been stitched back together, regrowing her parts into one. Seven years ago breast cancer gave me a test – the subject: Patience. The test lasted nearly a year and I learned a different way of living. I’d like to say I kept at it and maybe I did for a while. There are things I don’t do, like spend time with a huge distractor: Television. But there are things I do, like facebook and twitter, which can be just as much of a distraction as TV. Your post serves as a gentle kick in the pants for me and yet another reminder (you are the third…so obvioulsy a SIGN!) to be quiet and do nothing. After winter, spring comes and grass grows. Patty — This is a great topic for me as I don’t do patience all that well. It depends a lot of what I’m trying to be patient about. For example, medical tests are my worst. I read Peggy’s comment above and find waiting during a medical crisis the hardest, but there are ways I distract myself and find a way to be more patient. Humor works wonders for me. It’s one of my top strengths and it centers me. If I can laugh even in the dark times; I can be more patient. Another thing that works for me is being outside in nature. It puts me in the present and impatience doesn’t work well when you’re in the NOW. As far as being impatient to complete something…that’s something I’m still working on. I tend to get VERY focused on something and impatient to complete it. I have to actually make myself slow down and take breaks. Reading fiction is one way I do this. Hi Patty — I liked the idea of patience as something deep and earthy that’s always waiting for us — patiently, if you will — to realize it’s there and available to us. The earthiness of it reminds me of our animal (or perhaps vegetable!) part that doesn’t need anything but nourishment and sleep, and to whom all of our frantic human pursuits are just a momentary distraction from what’s always been true. Pass the stale bread. I need a heckuva lot more patience than I currently have (which is zero). It was good to read this, and I think you rock as an artist. Hey Tess, Giulietta, Peggy, Sara, Chris, and Tony – Thank you all so much for stopping by. I read and savored every word of your comments!